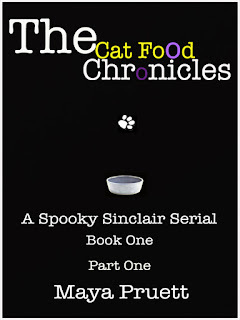 Musings of An Independent Artist: Dariel's Spotlight: Maya Pruett and "The Cat Food Chronicles"
Dariel's Spotlight: Maya Pruett and "The Cat Food Chronicles"
An award wining novel about two psychics sisters, one psychic cat, an irkily handsome detective, and a dead celebutante! Following in the footsteps of Britney, Lindsey, and the likes, Callie Bryant, Hollywood's newest bad girl, comes to town as the lead in the much awaited Romeo and Juliet ... the Rock Opera. When Callie actually dies on stage, Lily, Holly and Spooky (two psychic sisters and one psychic cat) get together with the irkily handsome, yet musically inclined Detective Richardson to solve the crime. cats, crime, cuisine, and lol comedy.